The centrepiece of our museum is Avro Lancaster NX611 'Just Jane'. 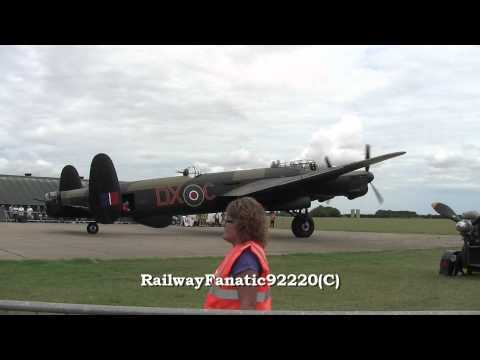 NX611 is one of only three working Lancasters worldwide. She taxys most Wednesdays and some Saturdays during the Summer season. Click here to check for dates when the Lancaster is taxying. When she is not taxying she is static in the hangar so you can get a close view of her. The Dakota is a resident aircraft at the Centre and performs many parachute drops and air shows through out the year. It is the only airworthy aircraft currently based here but is a Normandy and Arnhem veteran having flown in the conflicts. Mosquito NF11 HJ711 Owned by Tony Agar and based at the Lincs Aviation Heritage Centre, this is a truly fascinating restoration of a de Havilland Mosquito NF.11. The restoration is also unique as it's the only existing version of this variant in the world. The Hampden restoration project is a long term project for the Brian Nicholls Hampden Restoration team. Work is slow due to the large numbers of parts to be rebuilt from plans, many of which no longer exist. A wireless operator's training aircraft, this is also currently under going restoration. Tim Stote is continually working on his Proctor to take it back to a static exhibit and proudly take its place next to the Lancaster in our Main Hangar. Not quite an aircraft but nearly! The Link Trainer has finally made its way into the museum exhibits and is being restored into full working condition. They were issued to all airfields during the war to enable Pilots to practice flying by instruments. This is one of the most complicated and most interesting exhibits in the Centre and we will soon be able to give lectures and demonstrations using it on our open days.